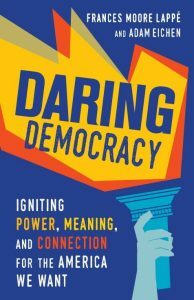 “Daring Democracy: Igniting Power, Meaning and Connection for the America We Want” is a wonderfully optimistic and idea-packed volume by activist Frances Moore Lappé and organizer-scholar Adam Eichen. It’s one of the denomination-wide Common Reads suggested by the Unitarian Universalist Association. The reading group is moving toward actions. This is a continuation of last year’s discussion of the UU Common Read, Daring Democracy. Using the solutions offered in this hopeful book as a base, we will explore and implement actions to restore democracy in the United States. Some examples we might consider are Campaign Finance Reform (a perennial favorite), Ranked Voting (recently passed in Maine), Restoring Voting Rights to Former Felons (yeah, Florida! ), National Popular Vote, An End to Gerrymandering, and Fair Elections. At our first meeting, we will decide when and how often to meet and our next steps. 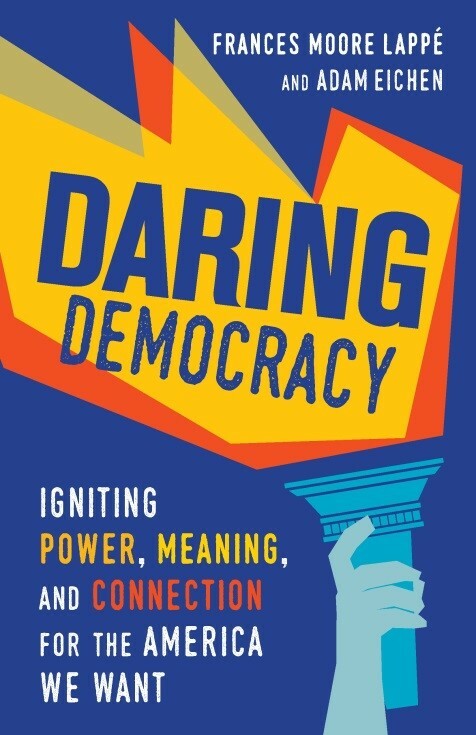 Daring Democracy is an easy, engaging, empowering, but not required read. New participants welcome! 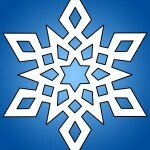 Sign up by calling the church office, 860-646-5151 or by email, at uuseoffice@uuse.org. Please include your name, course name, and date.